ALL THE TIME GOD IS GOOD! : Who You Already Are in Him. In the last few post we have endeavored to answer grace critics. We have already established the proper atmosphere the Church needs to foster. An environment of love and mercy flowing free from all law and condemnation nurtures restoration and wholeness. We have seen how a leader or mentor should address the sin issue. Now what about ourselves? What about when we fall and miss it? Does God abandon us? Is He fuming with anger toward us? I know legalism and tradition has said so. The Word says otherwise. That the waters of Noah would no longer cover the earth, So have I sworn That I would not be angry with you, nor rebuke you. Jesus and His finished work forever satisfied the need for penalty and wrath for sins. So when we sin or miss it God isn't looking to "punish" us or rebuke us. When we fall the Lord is not making sure you have a flat tire on the way to work. He is not sending infirmity or calamity to your life in order to get you "straightened" out. In my past I used to believe if I sinned or missed it in some way before my work day started I would automatically have a bad day. I had through my sin removed the hand of favor off of my life. We need to let go of these religious traditions. We can never have true confidence in God unless we realize that all our receiving of blessings and favor and "good" days are rooted in His obedience and finished work. Okay Ive removed the fear aspect of God "punishing" us if we blow it or miss it. So what are we to do when we sin? What about those negative behavior patterns? What of those sinful habits we just can't get freedom from? Let me explain the first step in finding lasting freedom. The first step into finding full freedom from sin dominating our lives is to know who we are already in Him. Let me expound for a moment who we already are. This is who we already are. Living outwardly who we already are on the inside is the progressive maturity we are all growing into. 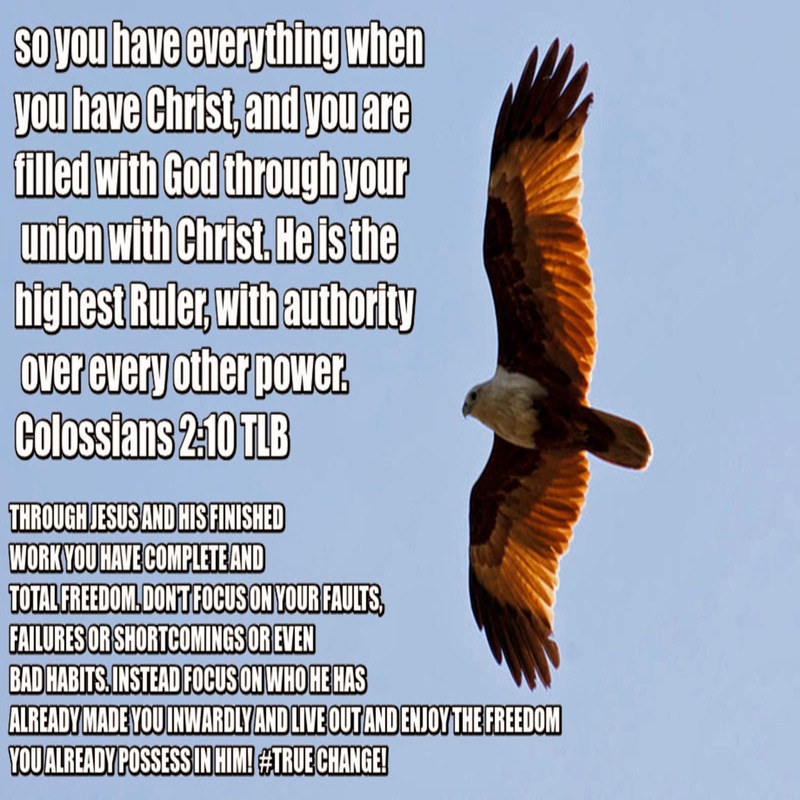 This is the true key to living in complete freedom and total victory. You may say, you are dodging the original question. What do you do if you have just sinned? What do you Mr. Grace man? OK I am glad you brought the question back to the forefront. I am showing not just how to deal with one sin but all the sins that seem to beset us. If we fall or miss it or through deception "dive" right into sin here is our right response. The Lord in His love gently reminds us who we already are. He doesn't place His hand on your shoulder and express His disappointment in you. No, He reminds us who we already are in Him and we simply repent. Does this mean we hurry to an altar, bawling and crying? Beating ourselves up for missing it? No, It means we simply change our minds. We change our minds about that particular activity. We agree with God and disagree with the thinking that this behavior is fruitful. Then, this is key, we confess our righteousness purchased by Christ! Confessing our righteousness by Christ is what allows our minds to be renewed to who we already are. Even in the midst of committing that sin or wrong, confess you are righteous. This doesn't make the action right suddenly but it reminds you continually of who you already are. Eventually, as you keep confessing who you already have been made, you will awaken to righteousness and sin will lose its appeal and hold on you. Lastly, Christ the Lord Himself helps us in this process. His love is not far from us in the midst of our "mess". When the temptations come or after you fall, even during the act itself He is continually gently whispering His loving Words to you, "I've got better for you." When you rest in His Words and fully realize how true they are you will walk in maturity of who you already are. To sum it up. What do we do if/when we miss it? We remember God is never mad at us. We know to simply yield to the gentle loving reminder Jesus has for us. He has so much better for us. We realize who we already have been made. We continually confess our righteousness. As I have said earlier. Sin will take you further than you want to go. It has unforeseen cost you really don't want to pay. It tries its best to leave your heart lacking confidence. So sin isn't appealing. We grace ministers are not teaching that sin is what we are to pursue. We are abiding in Him, and who we already are in Him. I know I keep repeating this phrase. I want it to "sink" in. I want our minds to be renewed to this glorious truth. I pray this post has blessed you. Too all those who are suffering out there for proclaiming these truths. I pray you be strengthened and never let go of the truth. Walk in love to those without the knowledge of the truth. By your fruits of faithfulness and love you will see hearts changed. Again thanks for all my friends all over the World, helping in getting this blog out. I never dreamed that sisters in brothers in Asia, and Europe and various parts of the USA would respond and be blessed by this blog. It is all the work of Jesus. It is His name I desire to see renowned. Thank you for taking the time to read. Please pass it on freely if this has blessed you. The Lord bless you with peace. I am so thankful for The Revelation of Truth. This blog confirms what I have been learning and believe. You write it in a way that I want to be able to share with others. Thank you for taking the time to write and speak The Truth of The Gospel. Thank you John!